Welcome to Noel McKenna’s ‘Map’ series where instinct meets a most personal experience. Born and educated in Brisbane and now based in Sydney, McKenna is one of Australia’s most industrious and idiosyncratic artists. With a busy career spanning more than 30 years, his work is admired for its spare brushstrokes and poignant observations. 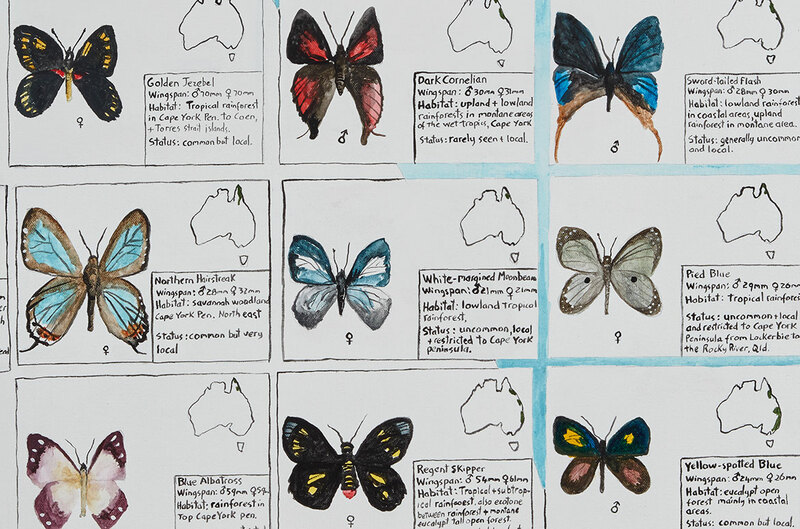 McKenna’s maps order Australia’s vast continent and here we focus on the two extremes – deadly snakes, spiders and sea-life and our loved birds, fish and butterflies. Hear from the artist himself as he takes us through his childhood memories, his discoveries, and how he tackled the task of mapping Australia. Dangerous Australia 2007 posits that, despite having a large number of the world’s most venomous snakes, spiders and sea-life, we are statistically more likely to die by human hands than be taken by any of these. We are more likely to die after a fall, by accidental drowning, by smoke and fire, or even by our own hands, than we are from the bite of a creepy-crawly. We may be afraid of the wilderness, but it is the wilderness that should be afraid of us. Shark, Ray Species of Australia 2006 is the only work of this group that lists its subject completely. Like wildlife photography, bushwalking and other activities that foster contact with nature, A self-described animal person, McKenna knows the value of a domestic animal’s companionship, but also of communing with natural beauty. His affection for nature evokes the kind of awareness that engenders our instinct to care for and protect it. It seems useful to strengthen this because, as we have seen, we are expert at building infrastructure and encroaching on the natural world. 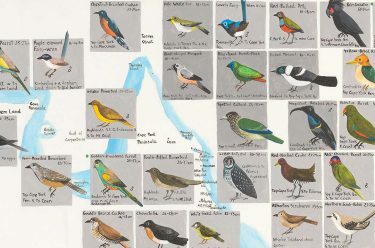 The natural environment is lovingly chronicled in Birds of Australia 2004, Australian Freshwater Fish 2005 and Butterflies of Australia 2010, showing mere fragments of the remarkable diversity of wildlife that occupies the sea and sky around us. Big Things, Australia 2004 — an outline map of the country populated with images and descriptions of ‘big’ tourist attractions, from the Big Pineapple to the Big Golf Ball —was inspired by a TV documentary. 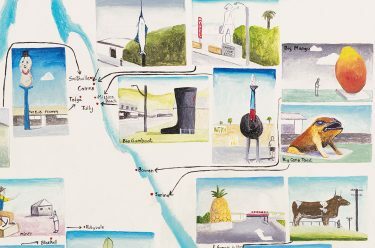 The works in Noel McKenna’s ‘Map’ series are on display as a group for the first time in ‘Noel McKenna: Landscape – Mapped‘ at the Queensland Art Gallery (QAG) until 2 April 2018. The exhibition publication Noel McKenna: Landscape – Mapped is available from our QAGOMA Stores and online.